YAY! 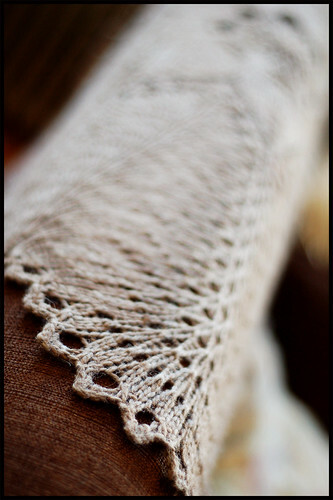 I am out from under my lace scarf! It’s done- finished, blocked, and already worn! It’s so pretty, but dang did that one snooze for a long time! The relief I feel is great… now to tackle some more lingering projects. I also finished up a beaded crochet bracelet that was lingering from Christmas time and I finished my second felted chick. 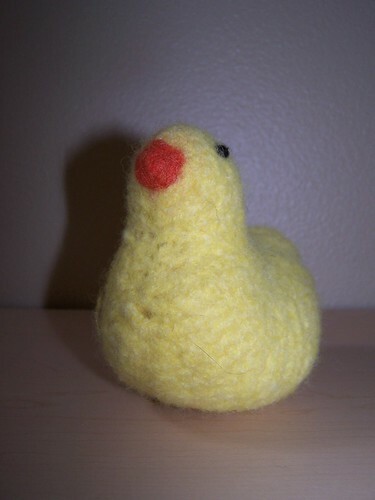 You’ll remember that my friend Malaika’s little boy was the recipient for the first felted chick, I think my high school friend Phaedra’s daughter who is on the way will be the recipient of the second one. 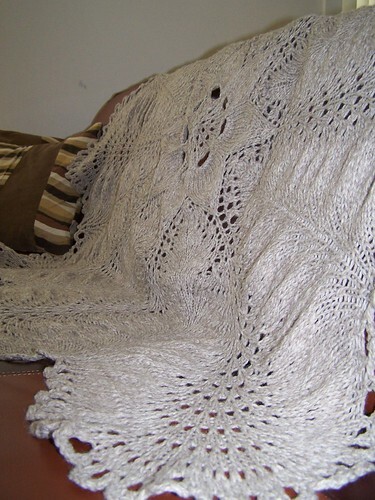 Hemlock Ring Blanket: Lace dream! 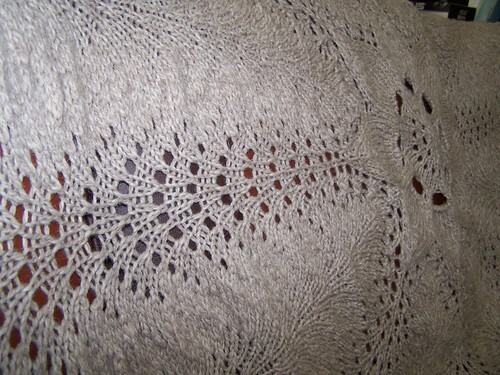 I finished the Hemlock Ring Blanket last weekend, but didn’t get around to blocking it until this weekend. I knew it would be pretty but OMG it’s gorgeous! 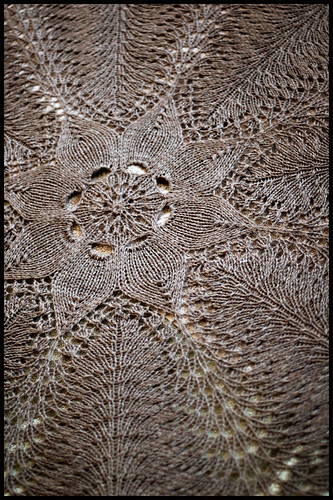 Because it’s knit in the round, it actually is naturally shaped like a hat (hence the photo of me wearing it as such) it also is all ripply because of the fan and feather pattern It looked a little like a sea creature. Blocking is essential for a piece like this. I let it soak in water for a good hour, draining all the water out and refilling a couple of times. I squeezed out as much water as I could before laying the blanket on multiple towels and rolling it up… then stepping on the towel/blanket role to get even more water out. Next I used every straight pin in the house to pin it out on a blanket- starting at the center and carefully working my way out. I pinned out each loop on the edge getting the blanket just right. then I kicked the cats out of my bedroom, and laid it on the bed to dry. Now it lays nice and flat! 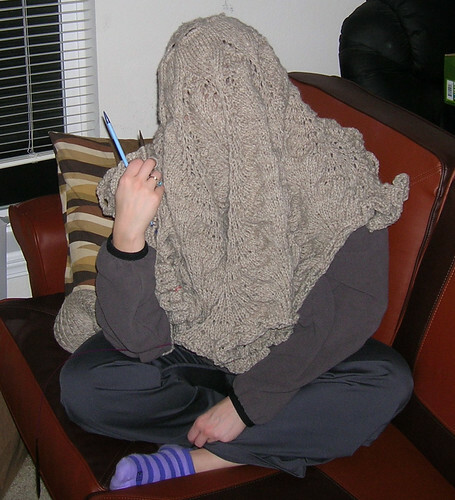 So, I have been working my way through the list of knitting i needed to finish. It’s time to make a new list. But I realized that I will be carrying over one item from the old list, an item I am embarrassed to say has been in my knitting bag for around 2 years now. 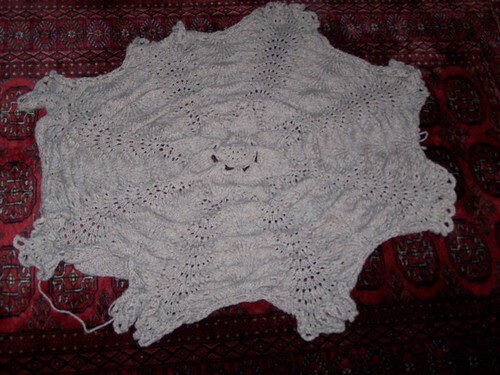 I figure I should “encourage” myself to finish this UFO (un-finished object) through public shame. We had a good laugh, but it’s almost true now- I have been knitting on that scarf for almost 2 years now- well not knitting, but having good intentions of knitting. 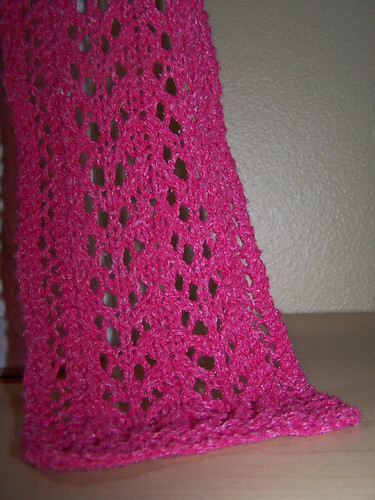 So, I am carrying over the infamous pink scarf to my new list of knitting. I’m calling myself out on my blog to try to keep myself on task. True to my nature, I’ve added more projects to my ever growing queue, ahead of projects that have been on the “bench” for a while. But this one, its so worth it. 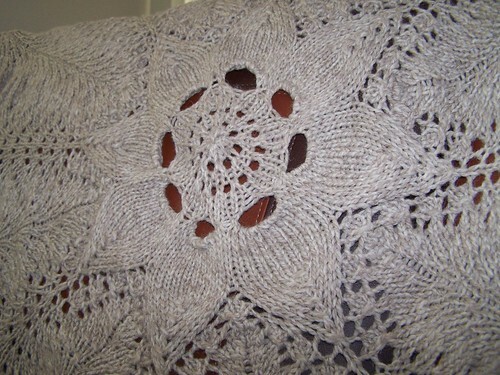 For a wedding gift, I am making a Hemlock Ring Blanket, a round lace wool throw blanket… picture it in your head, yes- it’s a giant doily throw blanket! 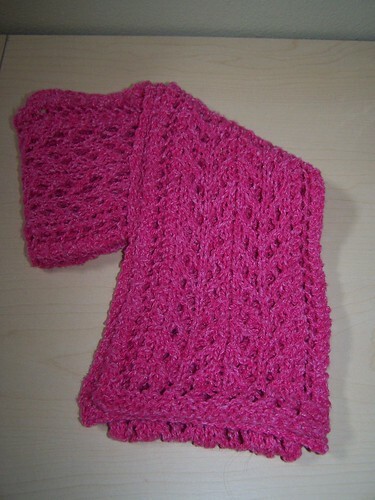 But it is so elegant and has been very engaging to knit (no pun intended!). 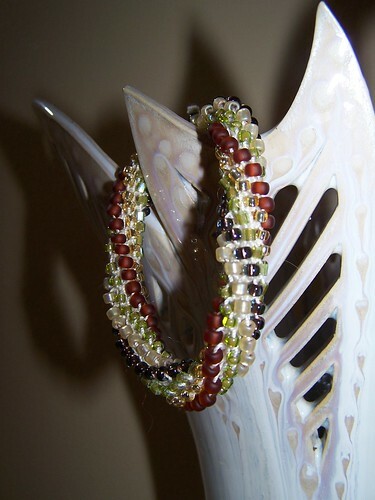 Cascade Ecological wool is great to work with and the natural color is perfect. 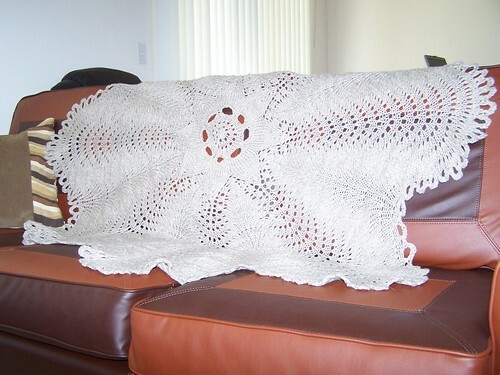 The pattern is a 1942 knitted doily pattern that blogger Jared Flood of Brooklyn Tweed blog up-sized and charted. 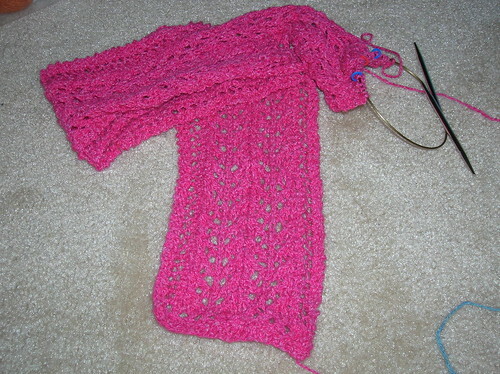 I am loving knitting this pattern! I may have to make another blanket for myself when I am done. 🙂 The photos below are not my knitting- I’m only about 60 rows in so far, these are photos from Brooklyn Tweed’s blog. I can hardly wait! I will post photos soon.